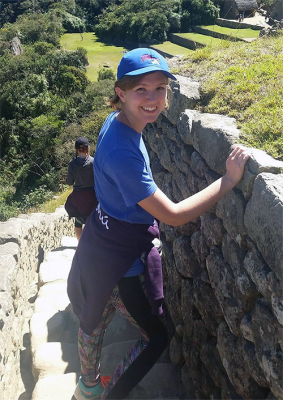 LaRisa Rowe during a mission trip in Peru. What attracted you to GCU? I moved to Queen Creek unexpectedly my senior year of high school, and GCU was recruiting there during lunchtimes. After touring many of the colleges in my home state of Colorado my junior year, I was certain that what I wanted was to get out of this dust bowl upon graduating and head back to Colorado. However, the field trip to GCU’s main campus was free and meant a break from school, so I thought, “Why not?” I had heard about GCU from my church in Colorado a year or two before when I was searching out Christian universities, but I thought, “That sounds cool, but there’s no way I’ll ever find myself in Arizona,” and I wrote it off. I recalled this much later as I walked onto this purple campus (my favorite color) and felt immediately at home. The intimidation and trepidation that had accompanied my other college visits and tours was nowhere to be found, and for the first time I was not only certain that I could live here but that I was excited about it. The atmosphere immediately put me at ease (we certainly spoil incoming students), and I felt like the school had been created to fit my needs and mesh with my personality. I’m now a proud alumna, and I’ll always be grateful for having found my oasis in the desert. What do you do for fun and where do you find that outlet? I am an English Literature major who loves to read and write (go figure). In particular, I love world mythology and poetry. I’m also a huge fan of Disney (a tale as old as time), hiking, camping, four-wheeling, amusement parks, animals, and cooking (although I don’t know what I am doing yet). What are you passionate about? I am passionate about many things — literature because I think it’s underappreciated; living a Christ-centered life even when it isn’t convenient or easy; approaching the world with love in my heart; taking care of our fellow humans, animals and our planet; art as an outlet; equality; and seeking joy. I also appreciate Nutella, the uses of coconut oil and OCD being corrected to CDO (in alphabetical order, as it should be). What are your favorite places or events in the Valley that you like to visit? I like to visit Denny’s, Glendale Glitters, Brelby Theatre, Camelback Mountain, First Friday events and the Phoenix Library. I am ashamed to say I haven’t visited the Grand Canyon yet, but Flagstaff and Sedona are beautiful! Tell us something about yourself that most people don’t know: I am left-handed (people never seem to remember that). I’ve had shingles. I have been to Paris and Germany. I speak some Spanish (mucho gusto). And I can drive a stick shift. What are you most proud of? I am most proud of my mission trips to Peru during my time at GCU, my time as assistant editor of the GCU Literary Review, being a Life Leader, completing a Global Portfolio, and graduating with honors despite being terrible at classroom Spanish. What attracted you to GCU? My mom is a GCU alumna from the College of Nursing, and a great friend of mine is a current GCU employee who has wonderful things to say about working for the university. After learning more about GCU and discovering an open position for which I felt qualified, I applied and here I am! What do you do for fun and where do you find that outlet? I love to camp, ride ATVs, hike and spend time with my family. My sister is my best friend and lives across the street from me, so we spend a lot of time together. What are you passionate about? Education is my passion. I have a B.A. 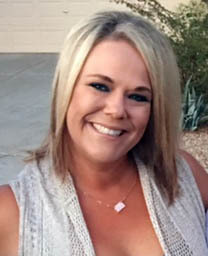 from Arizona State University in Elementary Education and taught kindergarten for seven years. Unfortunately, when the state cut the all-day kindergarten program, our district was forced to offer us part-time and that didn’t work well for my family. I am so excited to be back in the education field, continuing my passion to create lifelong learners. What are your favorite places or events in the Valley that you like to visit? I love country music and look forward to the summer concert pack that comes out every year starting in June at Ak-Chin Pavilion. Tell us something about yourself that most people don’t know: I am a native to Arizona and I have never been to the Grand Canyon. What are you most proud of? I am so proud of my two beautiful children and my nephew. My son is 6, my daughter is 4 and my nephew (who is like a third child to me) is 5.